Last year, when I was teaching Confirmation at my previous congregation, we were exploring the second article of the Apostle’s Creed. In looking at the passage, “suffered for us under Pontius Pilate, was crucified, died, and was buried,” one of the thirteen year old boys asked if Jesus HAD to suffer and die for us. He reasoned that if Jesus was God, he could have stopped it or avoided it. His question made me stop and think. Of course, Jesus could have stopped it…after all, he was God. With this thought, we reached an understanding that Jesus did not simply suffer and die, but Jesus CHOSE to suffer and die. 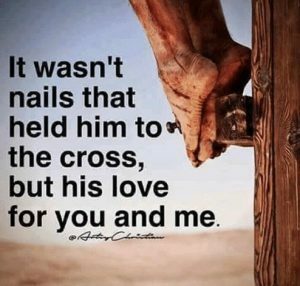 Now, it was our brokenness, our fallen nature, our corrupt systems, our sinfulness that unjustly arrested, viciously beat, and brutally nailed Christ to the cross. Yet, it was Jesus’ willingness to endure our anger and hate, our complete rejection of him, even unto death, that we encounter on Good Friday. The pain wasn’t numbed because he was God. Jesus, as fully man, experienced the reality of suffering and death that is part of our fallen humanity. This was not just an interesting thought for the Confirmation youth, this was a deep theological thought that left a lasting impact on me. God, through Jesus, CHOSE to suffer and die for us. Now, I don’t want to glorify suffering as part of “God’s plan,” especially the oppressive suffering of injustice we are responsible for creating and allowing in our world. 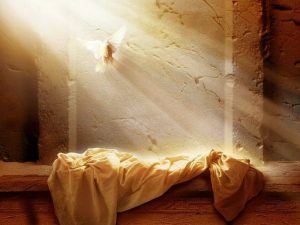 Let me be clear, the glory of God is most fully revealed Easter morning in the resurrection. Yet, we cannot get to Easter without experiencing Good Friday. 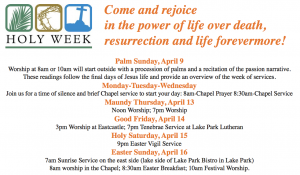 So what does that mean for us as Lent comes to an end and we begin Holy Week? I guess I find comfort in the midst of my earthly suffering, in the midst of my brokenness, that God chose to enter into and experience suffering in and through the incarnate Christ. The radical ministry of Christ in our broken world was inevitably going to be rejected. How could it be accepted? The Light reveals our shameful sinfulness, and we reject it, wishing to stay in darkness. Yet, as we journey through Holy Week, let us explore what it means that Christ journeyed through this darkness, that God still meets us in our darkness. 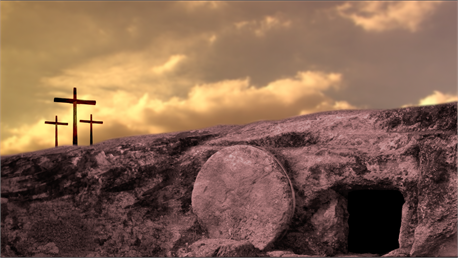 As we journey toward that glorious open and empty tomb, let us not hurry past the foot of the cross. Let us understand our role in crucifying Christ, let us be aware of his willingness to endure injustice, and let us give thanks for God’s promise to offer salvation at any cost. Let us embrace Good Friday as the epitome of God’s faithfulness and love, and encounter Easter morning as the epitome of God’s glory and power. God is not limited by our sinful actions. Rather, God can use all things, even our brokenness to reveal God’s glory. God sent Jesus to teach us how to live as God’s children. We rejected that message. We made God suffer, and God used it to reach us in our suffering. We made God bleed, and God used the blood to wash away our sins. We killed God incarnate, and God, not even limited by death, conquered death so that we may no longer be limited by death, but might receive eternal life. The glory of God is revealed Easter morning, but perhaps, we can experience the goodness of God in the chosen sacrifice of Christ. Amen!